Often I sign my emails, “grit and grace.” It seems to have more pep than more common words, like blessings, peace, etc. Anyway, it came to me as some kind of spiritual holism. 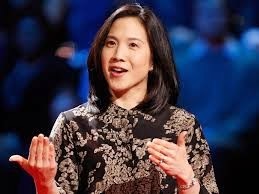 I recently listened to a talk by Angela Lee Duckworth, a psychologist at the University of Pennsylvania. 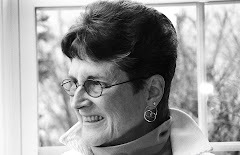 She has been grappling with the age-old familiar question of: What is the Key to Success? Now just how many how-to and self-help books have been written about success, as if it were marketable? It’s not on St. Paul’s list of spiritual gifts, nor does Jesus mention it, yet success has been associated with religious faith, and so has prayer. And there is the so-called prosperity gospecertain habits, purpose-driven lives, etc. etc. make for divinely sponsored success. Jesus failed, so let’s get over it. (That’s sassy, but you know what I mean. If it hadn’t been for Paul and the gospel writers, would he even be remembered, let alone his gospel?) Followers often mess up the founder's dreams. It could be that one of Jesus' gifts was his ability to attract followers who were really good at social media. Success is a quintessentially American cultural value, and quest. Can-do mentality is our gift and our curse. We are effective and accomplished, yes, but so prone to compulsion and self-deceit. We don't fail graciously. Instead, we sue. The Church too has been exploring its own success in the face of what looks like failure but probably is not, e.g. how many people come, how young are they, etc. Whoever thought of praying and asking Christ about all this? Dr. Duckworth has no easy answers, but she has amassed lots of statistics and studies on the question. Passion, perseverance toward one’s goals, hard work, belief in the future, being a marathoner not a sprinter—all present and accounted for. Unexpectedly, the strongest success predictors, talent, intelligence, personality, were not at all consistently correlative with regular success. Duckworth isolated on factor that was more consistently present: GRIT. How do you assure grit, even blessedly? Duckworth called it a mystery. We don't know why one person has grit and another doesn't. She offered an educated guess: get a growth mindset. It's possible to teach a child to believe that the ability to learn can change with effort. The most spiritual thing I heard Duckworth say was: Failure is not a permanent condition. Now that’s gospel! In fact, the Bible has more failure in it than success. Oh, it's depressing! Consistent, however, is human faith-grit and God's gritty grace. Neither give up on goodness nor on each other—plain idiotic, but true grit. Once a therapist of mine asked me who my hero was. She was trying to give me an image of power my mind could call on, because I was a wimp. Here it is. Hard to believe. I am adding GRIT to my list of words that describe resurrection—that transformative movement from death to life—not a one-time event, but an ongoing many-times-over dynamic. Grit is gritty. It’s a gut thing. It’s true and truth. God must have tons of it, lest why would Godde create such a mess, and never abandon it or give up hope for its growth? The other word that means resurrection to me is resilience—one of the latest and greatest word thrown about in the mental health field. It is almost as mysterious as grit but not quite as instinctive. The Latin root of the word is resile, to leap back. Sprong! Hell, Jesus called Peter a stumbling block and both men bounced back, one to face a trial with courage the other to start a church, God help him. Both had grit, resilience and resurrection. 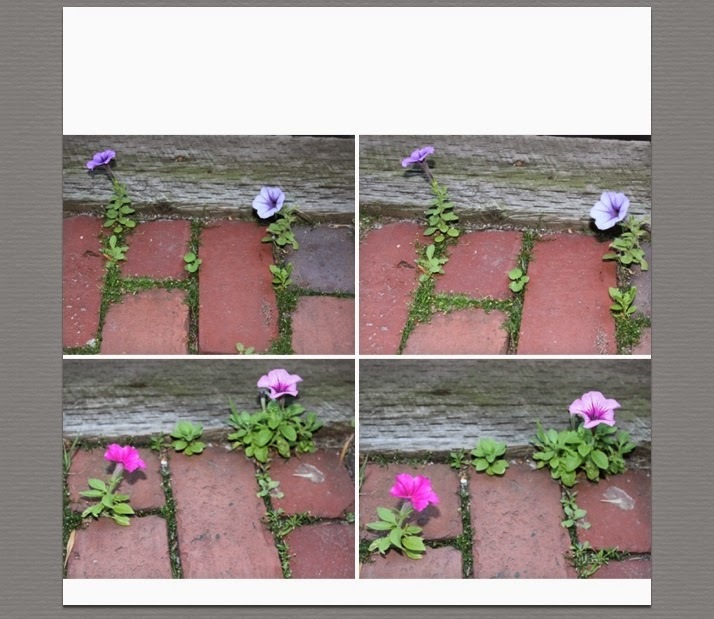 So in fact do these superb, determined little petunias on our brick doorstep—starting their own little garden no less. What gritty praise!